One of my favorite types of quilts to make are scrap quilts. 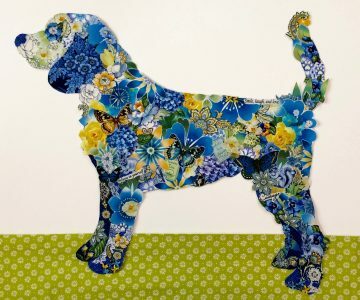 I love using up the little bits left over from other projects – and it’s a glimpse back to the days of our quilty grandmothers who made scrap quilts because they had to. I have several quilts my maternal grandmother made, and when my mother and one of my cousins looks at those quilts they say, “I remember that fabric, it was a pair of my pajamas!” or “That one was a little dress I wore to school!” I love those memories sewn into a quilt – so much warmth and love all in one place. And even though they were using whatever left over fabric they had, and were making a utilitarian blanket – at the same time those quilters made something beautiful. I took these photos on a bright fall morning in Georgia (notice I didn’t say cool fall morning) – the sunlight was coming in at an angle and was quite intense so the contrast in the sunshine was very dramatic – the quilting shows up well. I love the golden rod in bloom behind the fence too! Once I moved out of the direct sunlight, in the second photo, you can see the colors better. The quilting really pops in the photo below – this is an unedited shot too. All intense light and high contrast was just from the low angle of the sun – perfect to show off all those swirls in the light areas and the continuous curves in the color areas. Below is one shot of the full quilt – again the sun was so intense that the quilt almost glows. This is in front of my husband’s blacksmith shop – that little card trick quilt block to the right is something I painted in a class on barn quilts. I keep my scraps in bins, sorted by color. I recently went through them, took all the smaller pieces and the irregularly shapes one and cut them into 2 1/2″ strips and 2 1/2″ squares. This gave a little bit of order to the chaos that was threatening to overwhelm me – and was keeping me from using the scraps. 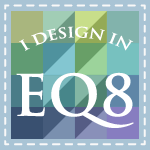 So now I can quickly and easily get to the fun part – actually making a quilt! I bought an AccuQuilt die cutter at my local quilt shop, The Stitchery, to help with this de-chaos-ing process – and wow, it makes short work of cutting the strips and squares! This particular quilt needed good contrast between the light and dark fabrics, so I also got a lot of help from this little ruler (below) called the Ruby Ruler from a quilter named Blair Stocker – she has a website called Wise Craft Handmade – good stuff on there! By looking through the red, it takes away the hue and you can focus on the value of the color – making it easier to see if you’ve got good contrast between two fabrics. I made 9 patches first, then sewed four of them together to make the bigger blocks. For this quilt, I pressed all the seams open so I could rotate all the blocks in any direction when sewing them together, and not have worry about a pressing diagram or if the seams would nest. I am normally in the “press to the dark” side of the great “Which Way Is Best To Press” debate in the quilting world, but not so firmly that I can’t see the benefit of doing it the other way sometimes. I also threw the rules out the window and used some fabrics with the wrong side showing – when dividing my stash into lights and darks, I discovered I had a lot less light fabric, so many of my little squares had to do double duty and be a medium value in one place and a light value in another. You can see in the photo below that the back side of the fabric is lighter than the front. I made myself use only fabric from my stash, so this was a good exercise in making do. And here’s look at some of the quilting again while still on my long arm. 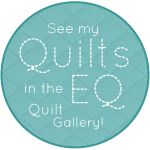 I used Quilter’s Dream 100% cotton batting and Glide thread by Fil-Tec, which is a poly thread and my new favorite – pretty much lint free so no dust bunnies in my bobbin case and it lives up to its name and glides right through the fabric. Beautiful! I did take some time to fussy cut some of the 2 1/2 inch squares – so cute! And well worth the few extra minutes it took. It’s fun to find them unexpectedly within the quilt. I put this on our guest bed and I’m using my grandmother’s pillow cases with the drawn thread embroidery work as shams. I don’t normally take pictures inside – I don’t have lights or even a decent camera, so they rarely turn out good enough to post. I’m breaking my own rule this time though, because I want to show the detailed work on the pillow cases.